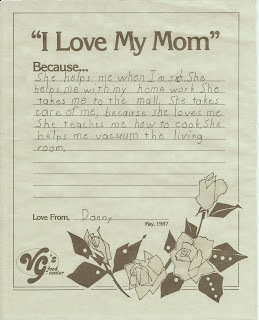 The “love” letter below was written to me by my youngest son at age 9 yrs. It is precious to me. He laughs when he looks at it and reads it now, but I know that it was written from the heart. Our children truly are gifts from God! I wouldn’t trade being a mother for all the money in the world. Thank you God for my children! These words of Ruth spoken to her mother-in-law, Naomi have always touched my heart. At the time, Naomi was urging her daughter-in-law, Ruth to go back to her own people. Ruth however loved Naomi deeply and would not leave her. Are you a person who has experienced the unconditional love of a mother? Did your mother sacrifice time and money for your sake? Was your mother always there for you when you were sick? Did she stay home from work to care for you? Did she lovingly pack your school lunch, putting in special treats or maybe leaving a little note to let you know she was thinking of you and missed you while you were at school? Did she make sure you never had to come home from school to an empty house? Did she ever give up her own serving of dessert or second helping of food so that you could have more? Being a mother means self-sacrifice, but the rewards are great. When a young mother brings her first child home from the hospital, she quickly learns what “self-sacrifice” is in the true sense of the word. The first thing she will sacrifice is more than likely, going to be sleep. Babies are a 24 hour a day job. They don’t understand when Mommy is tired or not feeling well. They will still expect to be fed and changed and played with. My own mother sacrificed much for me. After I became an adult my mother and my step father moved to Arizona to enjoy retirement in a warm climate. I never resented their leaving. I was married and had my own family by then. I missed them, but I knew that they were happy and healthy there. Mom had always loved the Southwest. She loved the mountains and the desert, the sunshine and the warm weather. She made many friends and was happy there. In March of 2000 Mom called me to say that she wanted to move back home to Michigan. I was very surprised, but welcomed the chance to have her close again. My brother and I helped her move back home in May of that same year. She was sad to leave the West. She missed her friends in Phoenix, but quickly made new friends here in Michigan and got reacquainted with friends she had left behind years earlier. It was wonderful for me to have her close again. I had forgotten what a joy it was to be able to go visit with her for a few minutes in the evening. I was happy that I no longer had to say good-bye to her and know that it would be another year before we see each other again. I remember all the times when I was younger and she sacrificed time and money for me. I remember the many times in my life when I was sick and she was always there to care for me. I always had clean clothes and a warm comfortable place to sleep at night. I was never left alone and expected to take care of myself. I am especially thankful to her that she brought me to baptism as an infant and taught me to know the Lord. Over the years as a counselor for young women, I have met many who have never known the unconditional love of a mother. They don’t know how to be good mothers to their own children because they have never felt that kind of love and nurturing from their mother. It has made me realize what a precious gift I had in my mother. It has helped me to be a better mother to my own children and grandchildren. Thanks mom! I love you! Be with the many young women who are mothers and have no clue how to go about it. Help them to realize that their children are precious gifts from you to be loved, cherished and nurtured. Lead them to know you and the unconditional love you have for all people. Help them to appreciate the children you bless them with as unique and precious gifts from your hand. Thank you for loving each of us as if we were your only child, and for the assurance that you will never “forget” us.